One of the best side effects from my fantastic experience at SAPPHIRE has been the ongoing conversation amongst the bloggers who were present (or invited) to the conference. For the most part, we have kept on communicating on a daily basis and the ideas keep flowing. The best description of this group comes from Erik Keller, who called us "The Irregulars". It's a good description of our motley group. One of the most frequent post-conference conversation threads has been about how to continue working together and how to integrate our group analysis into what we write. I expect in the coming months you’ll see a few different ideas emerge from the "Irregulars" in the form of group contributed work. For now, I wanted to present you with one hot of the presses. As we were tossing around ideas, I dawned on me that it might be useful to try and capture the spirit of what the "Irregulars" have been talking about and what we see as important emerging topics in one category or another. Let me not overstep my egotistical bounds here and imply that our interests are a proxy for what’s being talked about in the general blogosphere, press, or will be talked about by the analysts. It’s simply a perspective from our many varied vantage points (technologist, fund manager, ex-analyst, current analyst, entrepreneurs) that readers might find interesting. To this end, I have invented a sort of Gartner Magic Quadrant-like representation of “topic buzz” (note the specific avoidance of the word “meme”) going around in the group. 1) There is a backdrop scale for the topics: Hype, Strategy, and Reality. I set it up this way because I think this very much represents how topics flow through the blogosphere. Many never leave the hype spectrum, and frequently when they do they are simply adopted as strategy before a product is ever delivered. Take the evolution of SAP’s Mendocino project (now called Duet) over the last 2 years. It very much followed this path. 2) The relative sizings of each topic bubble show a very unscientific analysis based on related Technorati tags over the last 30 days mixed in with an intuitive sense about what is being most talked about by the group. 3) Note the core category at the bottom. Over time, if we and you all like this format, I’ll try and put out a few more of these for categories that we are all writing about. Imagine Oracle, Google, Microsoft, SF.com, or more abstract concepts like Open Source or BPM. There are many directions we can go. 4) For the most part, I wanted to keep the topics conceptual instead of product related. That’s why there is an OnDemand bubble and not a CRM OnDemand one. 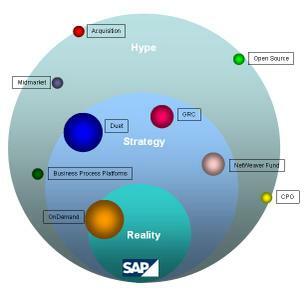 SAP’s OnDemand strategy is many faceted including CRM, Frictionless Commerce, the GlobalView deal with ADP, and the less talked about Managed Services group. In addition, one of the extensions I am playing with now is actually creating a specific TAG for each bubble. So as you surf around the net or write various blog entries, we can all have some consistent taxonomy to track the growth (or withering) of topics of interest. With that said, I’m going old school and daring to call this thing a 1.0 in a world awash of 2.0’s. I’d really love all of your comments and suggestions so we can make this as useful as possible. Perhaps, if it is useful, the Irregulars will publish monthly versions on a few key categories, tag all of our posts accordingly, and let everyone track what's being talked about more easily. I’ll keep you all posted. Daily Blog News Edition for the Irregulars, share amongst yourselves! One thing that is also missing here is any type of time line for things that already exist but are in different stages of their life cycle. It appears to me that this structure is useful for looking at things as they enter a launch or introduction phase in the market but what happens afterwards? Perhaps an extension so what you have is a series of overlapping figure 8’s that go from hype, strategy, reality to pilots, mainstream, mature (don’t know if those are the right words, but you know what I mean). Also if the size of the bubble is its interest, then perhaps its position to the left or right of center is indicative of whether it is buyer or seller driven. This actually works for your structure as when things become “real” there is a much higher degree of buyer-seller alignment than there is when things are hype. I like the idea. Just wondering if there is anything to the positioning of the various bubbles within the diagram. Eg why is CPO where it is vis-a-vis Acquisitions - both are in the hype space, but at other ends of the overall picture. Is this intended to have an SAP focus only?